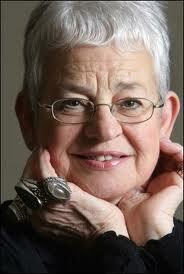 Five Children, Jacqueline Wilson and It? As part od Puffin's Classic's 30th anniversary, Jacqueline Wilson will be publishing an updated version of E Nesbit's Five Children and It. To be published in August, Wilson's story will centre around four contemporary children who travel back in time to meet Nesbit's original group. They discover the Psammead in a big sand pit in Oxshott Woods, Surrey and have their fondest wishes granted. "I loved the way she wrote very approachably. This is a kind of tribute to her because I so admire." As well as Four Children and It, we can look forward to The Further Tales of Peter Rabbit by Emma Thompson, and more! Thank you to The Bookseller for this information. Aimee McCourt's cross-border exchange partner, Caoimhe is coming to visit, along with her gorgeous brother Darren. As Aimee tries to get her best-friends' lives back in order - as well as her own- she finds that as long as she has her stack of lists, her cat, Rainbow, a hot chocolate and Facebook, nothing is impossible! Honest, fast-paced and just plain fun this is a delightful read without being simplistic or boring. This interesting bit of news came in today and I thought I'd share it with you. As you probably know, Michael Morpurgo's beautiful book War Horse has now been made into a feature film and is out in the cinema now... and the play is having a brilliant run in the West End, as well. (Now for the interesting bit...) In the past two weeks since the films opening, War Horse (the book has sold more copies in the UK than it has since it was first published 25 years ago! Pulisher, Egmont Press, says that in the last fortnight, War Horse has sold 30,000 copies per week in the UK; whereas it has sold 50,000 copies total worldwide between 1982 and 2007 (when the stage play opened) creating an average sales rate of 2000 per year in that time period. Staggering! World Book Day Extravaganza 2012!!!! The events will take place this year from Monday, 27th February through Friday, March 2nd. I'll be contacting the schools for confirmation of their attendance through the next 10 days. THIS IS GOING TO BE GREAT!!!!! Stay tuned for more exciting news about World Book Day! Do you know someone who is brilliant at bringing stories to life? It could be anyone...a parent, teacher, librarian... anyone at all! This is someone who brings such life and joy and entertainment to the story that you feel like you are right in the story and totally involved. If you know someone like this... then here is the competition to enter!! Visit the WorldBookDay2012 Channel on YouTube for directions on how to enter, but basically, it involves making a brief (1-2 minute) video of your favourite storyteller doing their thing and entering it! 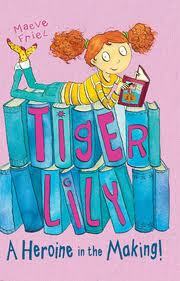 The winner will be crowned World Book Day's Storytelling Superstar 2012 in March. So get busy! The competition closes on 13th of February. Here's Cressida Cowell to tell you all about it! I just have to share this link with you. Find out what really happens in bookshops overnight! 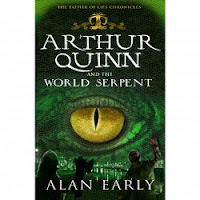 Check out the updated 'Arthur Quinn....' website and find out more about the UNESCO City of Literature Children's Festival. 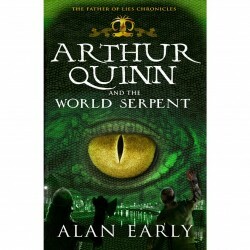 And if you haven't read Arthur Quinn and the World Serpent yet, what's stopping you? The second book in the Father of Lies Chronicles will be out this summer! 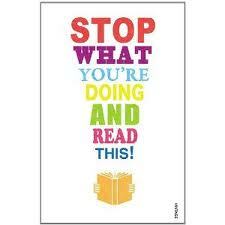 The title of this small book is Stop What You're Doing and Read This!... and so I did. 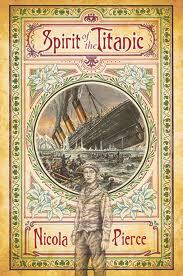 (In truth, I'd heard about this book late last year and have been waiting for it to come out.) In times when we are most concerned with the elements of our busy lives... work, sleep, finance, the internet... I think this could be one of the most important books that's been published in quite a while. Here, we are greeted by a series of essays from some of the most prominent authors publishing today and they are all about the value of reading. "People have always needed stories. 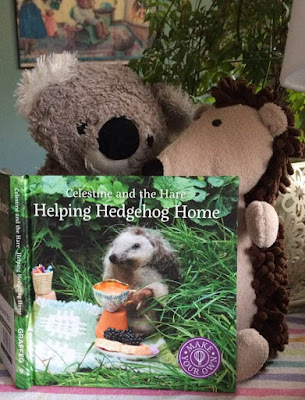 We need them to make sense of our lives, test our depths, understand our joys, and discover what humans are capable of", it says on the back of the book. And that's exactly what you find within it's covers. Zadie Smith talks to us about her 'Library Life', Tim Parks speaks on 'Mindful Reading', Nicholas Carr exposes the 'Dreams of Readers', Michael Rosen uncovers some 'Memories and Expectations' and Jane Davis encourages the 'Reading Revolution.' Oh, there is so much more in these essays that more than proves the point... books are important; in fact, I would say they are urgent. As I read this book, I began to reflect on my own history with reading and where this fanatical passion for books came from in my life. And why I believe everyone, absolutely everyone, desperately needs books (and, I do mean actual books) in their life, in their home and in their memories. My only worry is this... that this book won't reach the hands of those who truly need it. Out today - the Royal Mail has issued a series of postage stamps to celebrate the work of best loved children's author Roald Dahl. 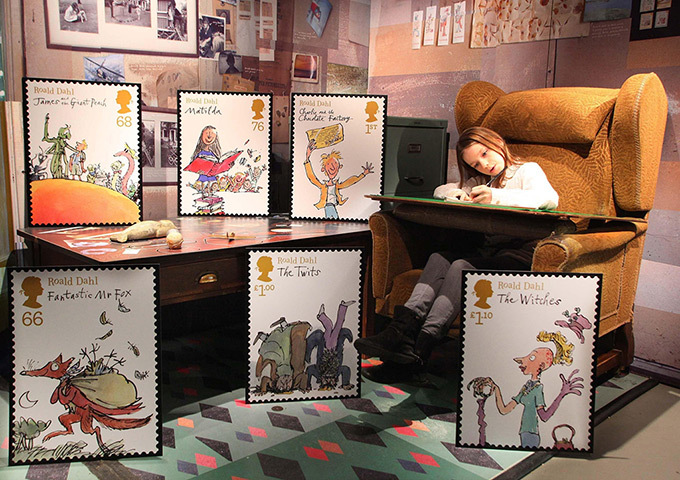 Featuring the illustrations of Quentin Blake, the stamps have images from all the favourites - Matilda, The Witches, Fantastic Mr. Fox, The Twits, and more. 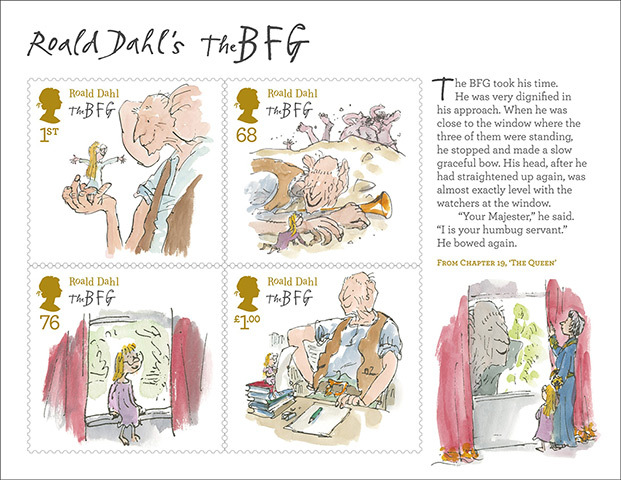 As this year marks the 30th year of (probably his most famous of all) The BFG being in print, there is a special sheet depicting four stamps with illustrations from the BFG.. as well as the image showing when the BFG met the Queen. "Dahl's daughter, Ophelia Dahl, said her father would have been "thrilled" about the stamps. "My dad wrote thousands of letters home throughout his life and never dreamed that one day one of his own characters would grace a stamp," she said. 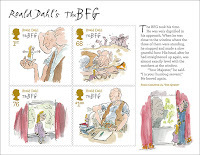 "This is an excellent way for us to kick off a year of celebrations to mark 30 years in print for The BFG and it's great that the stamps include a collector's set, devoted to The BFG and other characters from this book." New Year... new reviews on The Bookbag! The first is truly a must read book for everyone. 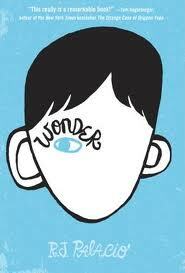 'Wonder' by R.J. Palacio isn't out for another month or so, but do keep your eyes open for this one! 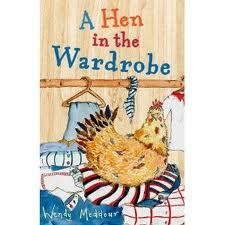 And the second is a marvellous read for confident young readers by Wendy Meddour entitled 'A Hen in the Wardrobe'. Definitely one you'll want to get your hands on! And I've copied the reviews in their entirety onto the 'What Are You Reading ' page here... so you can have a look there, if you like. I'm about to spend some time doing a spot of 'redecorating' here at Fallen Star Stories. How successful I'll be, well, I'm not sure. (Just not that computer literate) This is for my own purposes really... an attempt to keep fresh and lively... not necessarily 'up to date', whatever that may mean in terms of the blogosphere. I just feel the desire for something a bit different staring at me when I open up my site. When I get back to posting, it may look different, it may not. I do want to thank all of you who follow this blog, and those of you who may not follow, but spend some time in your week checking in. Oh, and before I forget, I want to express an BIG thank you to those wonderful people at Indigo. Someone there has been reading my blog and used a quote from Fallen Star Stories on the promotional poster (and it's on Amazon!) 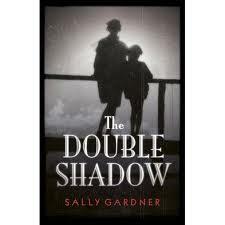 for 'Double Shadow' by Sally Gardner. Thank you, thank you, thank you.... it really made my whole year when I saw that!!!! Yes, another year has come and gone, and a new one has begun. Welcome 2012! I hope you've had the chance to enjoy a few of these (if not all) in the past year. If not, get cracking because 2012 looks like it's going to be another fantastic year in children's literature. 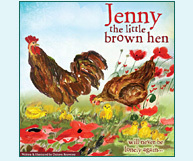 By the way, I wanted to give a big shout for my favourite children's books publisher of 2011. They are the brave and wonderful people at Little Island; publishing (just as it says on their logo) 'great books for kids and teens' right here in Dublin...... with more coming up on the horizon. Fabulous!